For the record, my thoughts on person-first vs. identity-first language! This was originally published on the AAPD intern blog. The phrase “person with a disability” seems like something that you’d find on packaging for action figures. Which is to say that recently I verbalized a lot of things that I think about the debate regarding person-first language ("person with a disability," "person with autism") vs. identity-first language ("disabled person," "Autistic person"), and the attitudes that people often express when talking about this issue, and other disability-related discussions where those same attitudes crop up. So basically, to me, “person with a disability” sounds like “Magneto action figure with detachable cape” – like the disability is an extra that comes with the person, but not really a part of that person. Lots of disabled folks and communities have valid reasons for wanting people to use person-first language – for example, people with intellectual disabilities often prefer to be referred to that way, and I respect that. However, when non-disabled people insist on only ever using person-first language, I often feel like it’s because they don’t want to play with the action figure until they’ve detached the disability, so to speak. When disabled people, Autistic and non-autistic, say that they use identity-first language to refer to themselves, a common retort is “I don’t understand why you would define yourself by your disability.” To me, this doesn’t make sense. I call myself disabled because I don’t think my disability needs to be held at arm’s length, not because I believe that I’m autism on legs. I was at a conference last summer at which Ari Ne’eman gave an introductory speech, and it fell to him to explain why ASAN uses identity-first language. One of the things he said, which I really liked, was “If I’m on a flight and the airline loses my luggage, I don’t arrive without my autism.” And I feel like this is actually sort of central to the difference between disabled identity-first proponents and non-disabled person-first proponents: they want the disability to be separable enough from us that we can hide it, pack it in a suitcase, and maybe, one day, be able to lose the suitcase forever with the help of a cure! Or, to use my earlier analogy, they want our disabilities to be like an action figure accessory that you can put on and take off, so that they can choose when to interact with and accommodate our disabilities. So why do I use identity-first language to describe myself? Because I like my disability, but more importantly, because it is a part of me that can never be separated from my personhood. I don’t want to encourage anyone to think of my disability as detachable from who I am. Autism is a mysterious and puzzling disease, and children who suffer from having been diagnosed with autism are equally puzzling and mysterious. But the remarkable actions of Joe Autie can give us valuable insight into the mind with autism. Autie, 32, is a person who experiences a label of autism, but has overcome his disability and managed to do something. Of course, because autism is such a mysterious affliction, we may never know truly know why. How does Joe Autie feel about his achievement? “We’re very proud of him,” said his mother. Emily Expert agrees, but she also cautioned that even though Autie’s actions do, of course, give us universal insight into the inner worlds of people with autism, we must be careful that none of those insights are positive in nature. So yeah, that was my best shot at writing an article about autism! How do you think I did? Here's why I'm attempting satire: this last week William LeFever, an autistic hiker who'd gotten lost in the desert, was found by a rescue team. Articles about this occurrence all featured a sentence like this: "Authorities credited autism training at least in part for helping them locate LeFever. One of the rescuers suggested searching near the river because he learned that those with autism are often drawn to water, reports The Salt Lake Tribune." We can all spot the flaws in that logic, right? We all know that there's not actually any evidence that autistic people are "drawn to water," right? Everyone understands that LeFever was by the water not because he's autistic but because humans need water to survive, right? 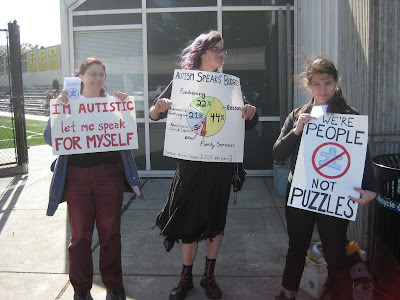 The problem is that autistic people are considered so exotic and mysterious that you can say pretty much anything about autism in a news article and get away with it. This post was first published on the AAPD intern blog. About twice a month I walk in front of a moving car by accident. About twice a month I choke while drinking. I don’t understand the ideas people have about disability sometimes. Like, obviously not all autistic people are the same, and our disability affects us all a bit differently. But at the same time I find it frustrating that when disabled people try to advocate for ourselves, we are often immediately dismissed as “not disabled enough” just by virtue of the fact that we have opinions we want to express. This doesn’t just happen in discussions about autism – I’ve seen people with all kinds of disabilities be accused of being “not disabled enough for your opinion to count” when they start talking about their rights. So today I was in Starbucks spitting coffee on myself and coughing, and people were asking me if I was okay and I wanted to say “I’m fine, this happens all the time,” but I couldn’t really breathe enough to talk. And what I was thinking about, as I recovered from my accidental attempt to breathe frappucino, was how angry it makes me that so many non-disabled people consider disability a moveable goalpost. Because here’s the thing: the same person who will argue that disabled people locked up in institutions need to be there because they might walk in front of a car or choke on food or water, will then turn to me and say that even though I have these experiences fairly regularly, I'm not Really Disabled, and they can tell because I don’t live in an institution. Can you spot the catch-22? So here's the deal: I haven't been blogging a lot, and my current internship requires me to blog once a week, so I may as well share those blogs here! This is my latest post from the AAPD interns blog, where you can read about the stuff that me and my fellow interns are thinking and doing. There's a new girl in the office and her brain is weird. One of the labels my weird brain has acquired is Pervasive Developmental Disorder Not Otherwise Specified - PDD-NOS, for short. This is an outdated term for autism, but I still harbor fondness for it because it includes the word "pervasive." My disability is indeed pervasive, affecting all areas of my daily life - including my work life, and including this internship. Being Autistic changes the way I interact with the professional world, in ways that have been - until now - Not Otherwise Specified. I actually really like working in a formal setting. I like my Senate staff ID badge. I like suits and pleats and zippers. I like taking the metro to work, I like leather shoes, I like taking my belt off and before I go through the metal detector and putting it on afterwards. I like going places where only staffers can go. I like feeling important, or at least feeling like I am a part of something that’s important. I like the actual work that I do most of all, but due to some things in my office being classified I can’t really blog about that in great detail, so instead I’m going to discuss the aesthetic that surrounds the work that I do, which I believe is called professionalism. On the whole, I like professionalism. I am working to get professionalism to like me. As I explore my career options I am trying to figure out what my Autistic professionalism looks like. I’m working toward a new standard of professional behavior – not a lax standard, but an accessible one. You’ve heard of business casual; this is business-NOS. Business-NOS is when your stim toy matches your suit. Business-NOS is elbows on the table, head in your hands. Business-NOS is being floppy at work because you’re going to be floppy anyway and you may as well get some work done. Business-NOS is flats only because you don’t have the gross motor skills to walk in heels. It’s trying heels anyway because you believe in the dignity of risk. Business-NOS is networking using only scripts and echolalia. Business-NOS is stimming and spinning in the Senate building, flapping in meetings, rocking in hearings, headphones everywhere. Business-NOS is a standard of professionalism which does not require eye contact, stillness, or median abdominal strength. Business-NOS means putting your passion and energy into your work, not into trying to look normal. Business-NOS is knowing you do good work, and not buying into the lie that someone like you couldn’t possibly do the good work that you are doing. This is what my professionalism looks like. How about you? Let me present to you a sequence of events. On March 6th, a 22-year-old autistic man named George Hodgins was murdered in Sunnyvale, California. His mother, Elizabeth, pulled out a gun, shot him point-blank, and then killed herself. People came to comment on these articles. They said that they felt sympathy for the mother. They called her George’s “guardian angel.” They said no one should judge her unless they had walked in her shoes. They said that it wasn’t wrong because he was autistic, and autistic children are hell to raise. They said that it wasn’t wrong because she was obviously responding to a lack of services. (In fact, she had refused services.) They said that it wasn’t wrong because he was disabled, so and his life couldn’t have been very good anyway. On March 8th, Robert Latimer went on television to talk about how loving and compassionate it was when he gassed his disabled daughter Tracy. He called for “euthanasia” – the murder of disabled children by their parents – to be legalized in Canada. A woman who appeared with him agreed. She has two disabled children who she would like to kill, but she can’t because it is against the law. No opposing viewpoints were presented. On March 17th, the Autism Society released a statement about “the tragic story of Elizabeth Hodgins,” which “shows that high stress on parents is very common in the autism community.” The statement, signed by both Autism Society presidents, blamed her actions on a lack of services. They also noted that “the divorce rate among parents with a child with autism is as high as 70 percent due to the pressure,” (this is actually a myth that was debunked in 2010). They never even mentioned George’s name. On March 31st, Patricia Corby drowned her 4 year old autistic son Daniel in the bathtub, in San Diego, California. We need to start looking at these murders as copycat crimes, which are encouraged when murders of disabled people receive positive press coverage. Just as Katie McCarron’s murder followed “Autism Every Day,” Daniel Corby’s murder follows George Hodgins’ murder, and subsequent media coverage which excused, explained away, or even promoted the murder of disabled people by our parents. When journalists call murderers “loving and devoted parents,” when television shows give Robert Latimer airtime, when parents normalize murder by saying that all special-needs parents have murderous thoughts, the result is an environment in which these murders are seen as acceptable. Media coverage like this sends a message that homicide is a normal, understandable response to any discomfort one might experience while parenting a disabled child, and we can’t pretend that other parents of disabled kids aren’t hearing that message. please take a minute to wonder if Patricia Corby heard you. While 44% of Autism Speaks’ budget goes toward research, only a small percentage of these funds go towards research into improving the quality of life of autistic people. Most of the research which Autism Speaks funds is devoted to issues of causation and “prevention,” including the prospect of prenatal testing. 2) Autism Speaks talks about us without us. Not a single autistic person is on Autism Speaks’ Board of Directors or in their leadership. Autism Speaks is one of an increasingly few number of major disability advocacy organizations that refuse to include any individual with the disability they purport to serve on their board of directors or at any point in their leadership and decision-making processes. 3) Their fundraising strategies promote fear, stigma, and prejudice against autistic people. Autism Speaks uses damaging and offensive fundraising tactics which rely on fear, stereotypes and devaluing the lives of people on the autism spectrum. Autism Speaks’ advertisements and “awareness” campaigns portray autistic adults and children not as full human beings but as burdens on society that must be eliminated as soon as possible. 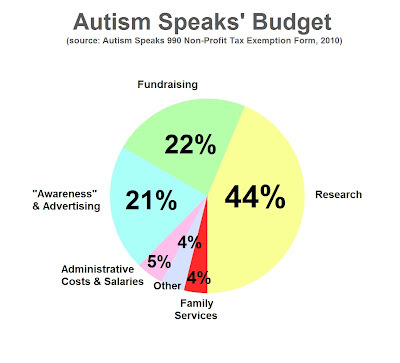 4) Autism Speaks is not financially responsible. Although Autism Speaks has not prioritized services with a practical impact for families and individuals in its budget, its rates of executive pay are the highest in the autism world, with some annual salaries exceeding $400,000 a year. Additionally, their fundraising expenses exceed their spending on most of their core programs. Given these facts, Charity Navigator rated their financial health as 2 out of 4. - The Autistic Self-Advocacy Network (ASAN), which provides support, community, and public policy advocacy, by and for people on the autism spectrum. brings together the academic community and the autistic community to develop and perform research projects relevant to the needs of people on the autistic spectrum. In the wake of this tragedy, I read a lot of articles that asked the readers to imagine how George’s mother must have felt. But I didn’t see a single article that asked the reader to empathize for George, to imagine how it feels to see your mother point a gun at you. I’ve seen a lot of people talking about how hard it must be to live with an autistic relative, but I didn’t see anyone talking about how terrible it must be to die knowing that your parent, who you love and depend on, has decided to hurt and kill you. The story of George Hodgins’ death is being discussed and presented as the story of a mother who snapped, and the story of other parents who have felt the same way. It’s being told as a story about a lack of services for families with special-needs children, as though a lack of services is a justification for murder. When disabled people are murdered by their families, this is the story people want to hear. It’s the same story that we saw in newspapers after Katie McCarron was murdered, and after Jeremy Fraser was murdered, and after Glen Freaney was murdered, and after Zain and Faryaal Akhter were murdered. The story goes like this: it is understandable that someone would kill their disabled relative if they don’t get help to care for them. Because the story of George Hodgins’ murder is also the story of the disabled community losing one of our own. It’s the story of the other disabled people who were murdered by their family members, and it’s the story of the society that thinks so little of people with disabilities that these murders are all too often justified as “understandable.” Most of all, it’s George’s story – the story of a young man who enjoyed hiking, who was always looking to learn new skills, who had his whole life in front of him.